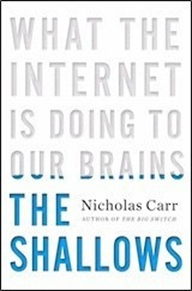 This week I had the opportunity to read through ‘The Shallows’, an interesting book by Nicholas Carr where he describes the weird, new, artificial digital world in which we now live in. The consequences of the mental and social transformation created by our new electronic environment are ubiquitous. The technologies we use to find, store, and share information can literally reroute our neural pathways. Carr explains the difference between the book and the e-book in a fascinating way. The hyperlinks on the internet lead us on from one text, image, or video to another while we’re being bombarded by messages, alerts, and feeds. This glimmering realm of interruption and distraction impedes the sort of comprehension and retention ‘deep reading’ engenders. Whether it is the web or the hand held devices, addiction of sorts is here to stay. With our growing need to get breaking news and information alerts at our finger tips, we are becoming increasingly impatient as a race. We are all so driven by machines and the internet that we have virtually stopped to think and reason the results of our findings. See if you can stay off the web long enough to read it! Some will argue that the Internet is turning us, and especially our kids, into fast-twitch airheads incapable of profound cogitation. It is important to maintain a balance between exercising our mental faculties and resorting to using the web to help us find all the answers to our problems. Let us always remember that our brains are smarter than our smart machines. Carr (who, yes, uses the Internet) interprets a staggering amount of scientific evidence and social history to show how we shouldn’t allow the Internet and its accompanying practices to dictate our lives. If you believe in all of above, get a copy of the book (hard copy) and draw your own conclusions. Visit www.sharadagarwal.com for further reading.